North America’s grasslands are among the most imperiled ecosystems in the world. Consequently, America’s grassland birds have declined more than any other bird group in the continent, some species by as much as 80%. Because the vast majority of America’s grassland birds breed on private lands, working with ranchers is our best hope for conserving them. Ranchers are stewards of America’s grasslands. Our strategy is to keep them ranching. 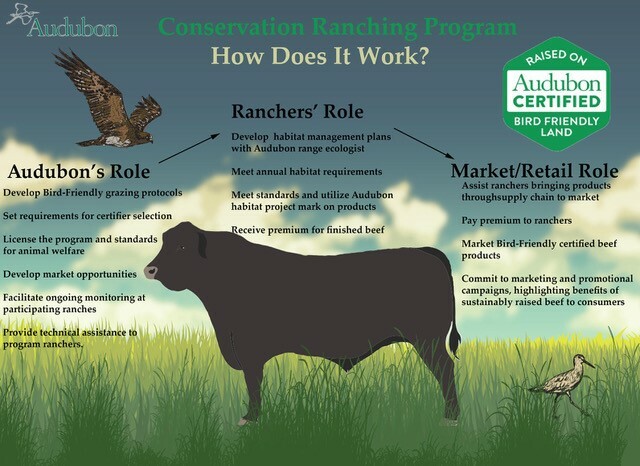 Conservation ranching is a market-based approach to grassland bird conservation that empowers consumers to support management practices that benefits birds and other wildlife. When managed properly, cattle grazing can actually improve bird habitat by diversifying structure and species composition. Conservation ranching practices ensure diverse bird habitat, healthy soil, abundant pollinators, and cleaner streams. To ensure these goals are met, Audubon conducts bird surveys on certified ranches with rancher consent. Beef from Audubon-certified land is hormone and antibiotic-free, ethically raised, and delicious. Supporting Audubon-certified ranches is better for grassland birds, better for the land, and better for you. 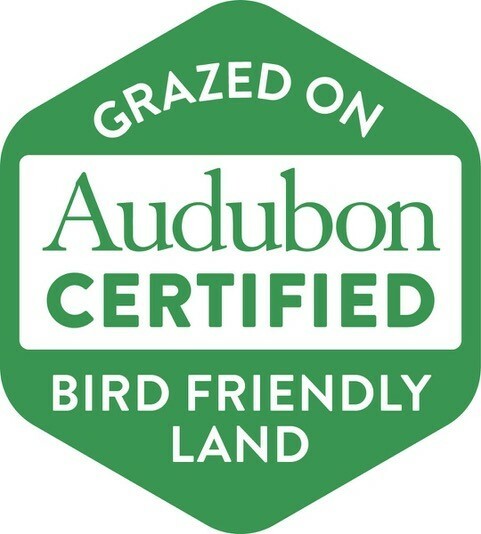 Our certification seal can be found on high quality meat products and empowers consumers to support ranches that benefit grassland birds and their habitat. Beef from Audubon-certified lands garners a premium price and provides a unique opportunity for ranchers to showcase their excellent management practices. This helps them care for their families and provides exceptional habitat for wildlife. By first listening to the ranching community, trusting in their knowledge of sustainable land management, and learning from their resiliency in a volatile marketplace, we are ensuring that our strategies and solutions will benefit both people and nature. Buying beef from Audubon-certified lands supports rural economies and the ranching way of life. We thank the NRCS USDA for their support.